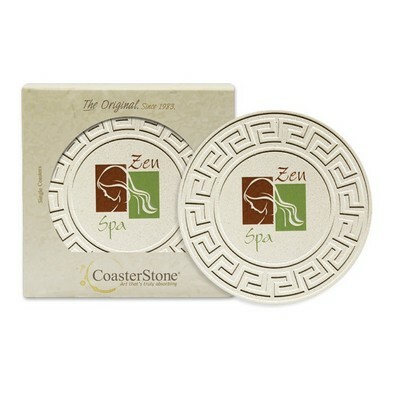 Help your clients and employees protect their furniture with a lovely personalized Round Greek Key 4.25" Stone Coaster. Imprint your logo on this practical gift. Clients will appreciate the elegant look of a customized Round Greek Key 4.25" Stone Coaster on their living room table. This round coaster is etched with a Greek Key pattern around the circumference and has a cork backing to prevent sliding and protect tabletops. The coasters are individually packaged in a printed box. Our sturdy stone coasters will last for years to come on your board room table or as gifts for clients.